How To Get Started In Mining In New Britannia? One of the best and easy way of earning Game Gold in New Britannia is mining. Basically, Outlanders go out to the world and mine for iron, copper, gold or silver ores and other metals and sell them to other Outlanders for Game Gold. 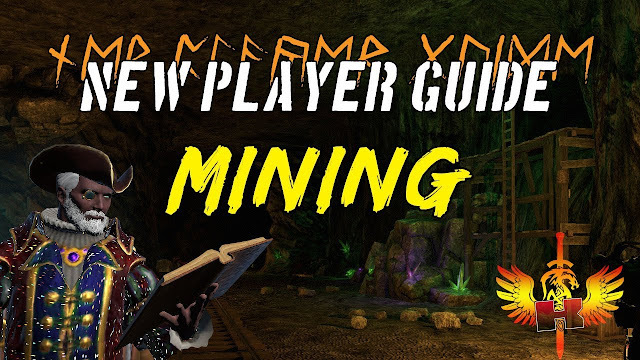 Getting started mining is also very easy, interested Outlanders just need to learn the Mining Skill from the Crafting Trainer NPC, buy a pickaxe from the Crafting Supplies Merchant NPC, equip the pick axe, head on over to the nearest mines and start hitting all the ore veins they can find. As soon as they get enough ores, they can go to the nearest NPC Town or Player Ran Town and list their ores for sale in the Public Vendor. Of course, Outlanders can also sell their ores in their own Player Vendors if they already own one. After listing their ores for sale, they can go back into the mines and continue mining for more ores to sell thus repeating the entire process all over again. As for the best location of the mines that Outlanders can mine from, it really depends on their own abilities. New Outlander miners can start mining in the new Low Level Mines located in Solania, Storm's Reach and Jaanaford. Of course, there's also the Owl's Nest Mines in Hidden Vale. For veteran Outlander miners, they can choose from Elysium Mines, Verdantis Mines, Spectral Mines, Graff Gem Mines and Serpent's Spine Mines. Obviously, mining is not the most exciting activity Outlanders can do in New Britannia. In fact, it's a very boring activity but, with a little patience, anyone can make mining a very good source of Game Gold.